Londonist first encountered Moist at a gig at The Spitz back in September, the evidence of which can be found here. If you were ever in any doubt as to our commitment to heavy metal psychedelic ambient jazz, think again - we really love Moist. These guys are seriously talented. 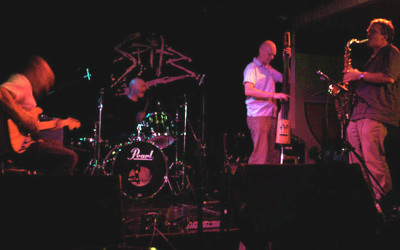 We highly recommend you catch them on Thursday night (23rd March), when they play at The Fleapit, on Columbia Road. For now, have a listen to Moist - "The Scrounger". That sounds like way too philosphical a question. Heavy metal psychedelic ambient jazz played by a bunch of softies. We were all previously members (or floating members) of a band called Lob, which was a kind of ambient electric jazz collective. When that broke up, it seemed logical for the four of us to carry on and do something a bit different. Everyone from King Curtis to King Tubby to King Crimson. But not King Kurt, King Missile or King. We're still in the research and development phase! Not sure we really have one. We just like playing. A lot. Someone we could blow off the stage, preferably. Acoustic Ladyland? To which record label would you most like to be signed? No. It sounds like it might be dangerous. 'Geography' by Lob. (only joking). Because we might buy them a pint. And our music's quite good too. What's your favourite...venue to play In London? ...venue to go to in London? Yes. It's nothing to be proud of, though.